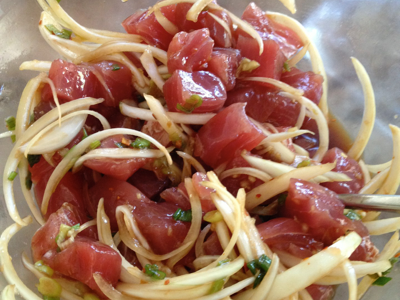 I LOVE poke, so I wanted to make it at home so I could eat a bunch of it! I made it for my cheat meal, but it’s really quite healthy. This version I made with ingredients suitable for a paleo diet. 2. Combine all other ingredients in a large glass bowl & refrigerate for at least 30 minutes before adding the fish.